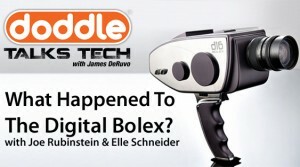 HomedoddleTALKS Tech - PodcastsdoddleTALKS Tech: Whatever Happened to the Digital Bolex? In this episode of doddleTALKS Tech, I finally track down Joe Rubinstein and Elle Schneider, the creators of the much-hyped Digital Bolex D16 digital camera. Joe and Elle talk about their big splash at SXSW in 2012, the lessons learned from raising seed money through Kickstarter, and why their camera hasn’t hit the market yet. doddleTALKS Tech: Whatever Happened to Digital Bolex? By James DeRuvo (doddleNEWS) Drag and drop visual effects is the subject of this episode of the doddleTALKS TECH podcast, and joining me to talk about it is Sean Mullen of Rampant Design.